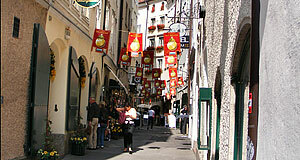 The Judengasse is a narrow lane in the Old Town or Altstadt of Salzburg. It is an extension of the Getreidegasse and links the Alter Markt square with the Waagplatz square. The Judengasse is a shopping lane full of expensive boutiques and among the most touristy corners of Salzburg. There are several buildings in the Judengasse that are of historic significance; many of them are linked with the Medieval Jewish community of Salzburg. Judengasse means "Jews′ Lane". For details, have a look at our article on the Jewish History of Salzburg. The Judengasse was the Jewish quarter of Salzburg until the second Jewish pogroms in 1404. The most significant of the Judengasse buildings is the former Höllbräu or house number 15, today′s Radisson hotel. Its foundations can be tracked back to a military building once erected by Emperor Friedrich Barbarossa before 1270. In 1370, the building was recorded to be home to the local synagogue, even though this claim is disputed. In any case, the current house number 15 was definitely mentioned in 1423. In 1449, the building was reported to house a brewery - the second brewery in the lane; in the following years, the city walls gradually moved towards the Salzach River and the Höllbräu house was supplemented with some side-wings. In the 18th century, the Höllbräu had grown into a typical Salzburg brewery of regional significance. It remained a player in the local gastronomic scene until the city saw the rise of industrially brewed and distributed beer in the early 20th century. In 1922, the Höllbräu closed its brewery down. In 1992, the building was renovated and became a hotel. The renovation was done very carefully and won an award; several sections from various eras were preserved, including a branch of the Almkanal, once used for power generation in the brewery, parts of the ancient city walls and two Medieval water reservoirs. Today, the Judengasse is popular for its many shops, including one that specialises on Easter eggs and Easter ornaments. Note also that many of the pubs and bars at the Rudolfskai can be accessed from the Judengasse, which makes it part of the nightlife and party hood of Salzburg. Franz Schubert once lived in the Judengasse during an extended stay in Salzburg.